The Austrian Grand Prix took place at the same venue as now, Well, kinda... Then it was called the Österreichring, and while from looking at the respective layouts of the track then and the Red Bull Ring of the modern day a family resemblance can be discerned, and of course the stunning scenery of the Styrian foothills is largely unaltered, really the current circuit shares little other than location. That apple fell far from the tree. In 1986 it was a near flat out blast through the hills, and loosely speaking each of the current track's tight turns then in their stead then had fast fearsome sweepers, many with little room for error. Even though it had appeared on the F1 itinerary only relatively late, in 1970, the Österreichring could easily have been something taken right from the sport's mighty pre-war days. Even by 1986 standards this made it unusual, as the relative lack of sharp turns meant top speed was the thing here and any lingering problems over low speed grip and acceleration would for one weekend only be punished minimally (a third gear chicane at Hella-Licht that started the lap was the solitary black sheep). And this played right into the hands of those with BMW power. The German marque hadn't had much joy in 1986 up to that point with its championship-winning 1983 season feeling already like it was from another age, both for the engine supplier and its then-victorious works team Brabham. This was especially so as Brabham's low-line BT55 was problematic with poor traction (designer Gordon Murray explained later that the tilted - in order to fit in the shape - engine didn't scavenge the oil back from the cylinder head on corners, something not discovered until the season was pretty much over). Exacerbating this further the BMW power delivery remained rather like an on-off switch, but top end grunt it did not lack in the least and its driver Riccardo Patrese looked forward to this track "where there are no really slow corners to give us any big problems!" Combined with this for all of the compact Brabham's woes its shape helped it fly through the air once it was up to speed. Sure enough the Brabhams were the fastest things through the speed traps and looked close to favourites for pole. It unravelled gradually but definitively for the Chessington squad though. First off Derek Warwick in the other Brabham had a spectacular accident on Friday when a tyre exploded. And it was a double whammy as Pirelli because of it had to withdraw its latest narrow tyres, which its customers reckoned were "undoubtedly quicker". The next day too Warwick's engine was oddly non-responsive and he could only qualify tenth. That left Patrese, who gave everyone hope by slamming in second quickest time in Saturday's qualifying. Riccardo reckoned there was more time in there but his second effort was ended early when his Beamer unit unstitched itself spectacularly. Still he'd be starting fourth and optimism for the race lived on. under CC BY-SA 2.0 via Wikimedia Commons - https://commons. But there was another car out there pushed along by the BMW too that was well capable of taking pole in Brabham's stead. This was Benetton. This team had, previously as Toleman, been a joke for a while before starting to go fast enough to be respectable at least - including of course in Senna's celebrated debut year in 1984. Now at this point of history many stars at this team were coming into focus for it to become a proper player. 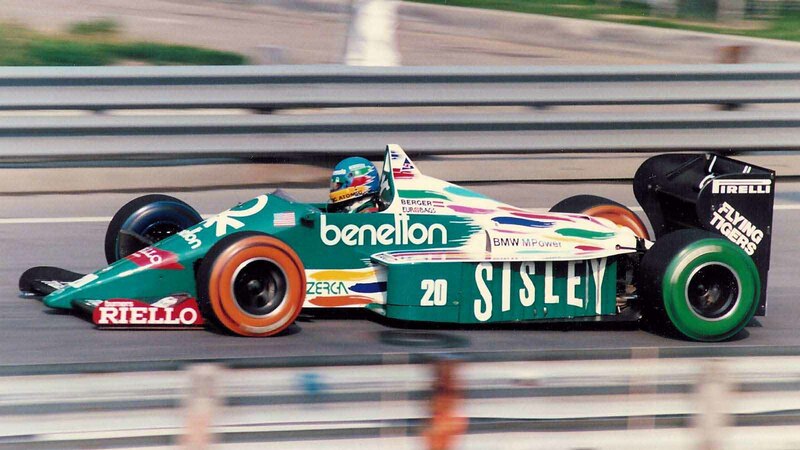 And for the first time in Austria the Benetton had a BMW qualifying engine in the back (in the days of quali-special grenade engines good for only a lap essentially). It also had a superb Rory Byrne-penned chassis, the same Byrne who went on to have considerable championship success not only at Benetton in future but later at Ferrari too. All-in the combination in Austria was a potent one and not to be touched. This Austrian weekend was rather the team's star is born moment. Then there was one of its drivers in Gerhard Berger, who after a season and a bit among the teams towards the back now with this opportunity was really beginning to show his pace and elan. 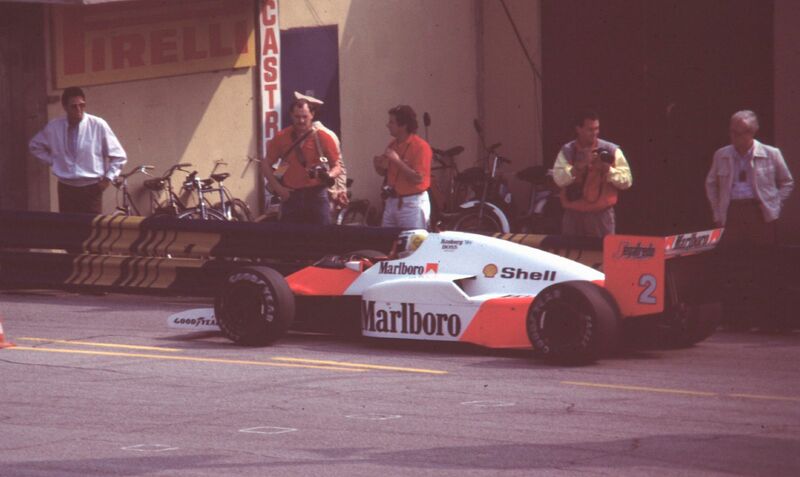 He'd bagged his first podium finish at Imola as well as had a front row start at Spa (albeit spoiled it there by getting involved in a first corner scrape). He'd be a consistent front runner for the next decade. And now at home and therefore in the perfect place it looked like he had an opportunity to sweep the board. And he very nearly did in qualifying on Saturday as he unleashed a fast one to go top of the times, two tenths under Rosberg's. But almost before all could comprehend this someone got two tenths under his mark - that someone being his team mate Teo Fabi. His pole lap was extraordinary though, in that he reckoned even more time was there. He did it in the spare car after a misfire in his own, the balance of his spare wasn't great but the engine it transpired was something else. Furthermore his onboard radio came loose during the lap and fell down into his pedal area... And he got traffic. While Benetton also like all others with Pirelli rubber had to use the less quick wider tyres. Berger had another go at taking pole for himself but while it all but matched his previous time a misfire precluded improvement. The grid was set; the front row was to be, unusually, all green. Underlining just how unlikely this starting order was, for the gang of four mentioned, who had shared all of the wins so far that year and all but one pole, none of them this time could be found in the first four places. And while admittedly on a track that hardly could be more different, just a week earlier in Hungary the two Benettons had qualified mid-grid and upwards of three seconds off the pole time. The Brabhams were even further back. There perhaps was something of a sliding doors moment in Styria this weekend too as rumours swirled beforehand that Benetton might not hang around in F1 after that season. It did, indeed developed into a championship-winning outfit eight years later. No doubt having the front row to itself helped convince the clothes company that F1 might provide some return on its investment after all. For the most part it was the McLarens that had to be pushed back from the front of the queue by the insurgent Beamers. Rosberg indeed had topped the times in Friday's qualifying session having dislodged team mate Prost right at the end of that running. The rear grip of the John Barnard machines was still without equal and even now the chassis combined with the TAG unit tended to be good on quick circuits (it had locked out the Hockenheim front row indeed two rounds earlier). Neither was too happy though as Rosberg had to sit out much of the day thanks to engine problems while Prost was never happy with his handling. This latter issue continued on Saturday too (as well as in the race-morning warm up session) while Rosberg himself wasn't able to take much off his Friday time. Third and fifth with Rosberg ahead was the best they could do. By now things were getting critical for Alain more generally. In a McLaren-TAG that no one thought a match for the Williams he'd kept himself in the championship running, indeed somehow had led the way for much of the year. But coming into this one he'd scored but one point in the previous two rounds thanks to running out of fuel in Germany and technical troubles in Hungary. He now was 11 points - more than a race win - adrift and at real risk of slipping out of the picture. 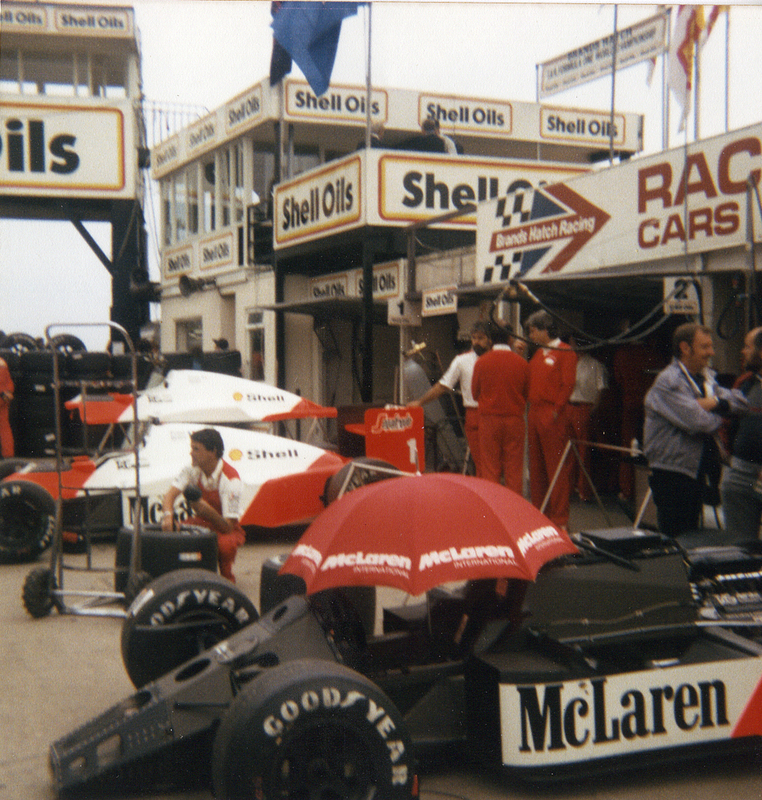 And therefore, extraordinarily, there was no haughty Williams-Honda FW11 in the first five grid places. Nigel Mansell starting sixth though could at least be content he was the quicker of the two, especially after the intra-Williams 'driveshaft gate' of the previous week in Hungary. Especially too as he'd lost a lot of running time with an engine blow up and then a poor-performing replacement unit on Friday, followed by a driveshaft breaking on Saturday stranding him out on track. Just as he was getting properly up to speed in final quali Patrese then oiled the circuit. That meant Nelson Piquet was but seventh. Off the back of two wins on the bounce he was curiously off song here, not helped by a funny belly resultant apparently of eating some wild mushrooms... While Ayrton Senna, usually in harness with his Lotus-Renault the qualifying king, languished down in eighth. Senna had his own technical woes, but generally it was a circuit that Lotus of this era struggled to click at. It meant the Brazilian pair that had lapped the field in Hungary a week previously could but fill row four. Neither was more of a factor come the race. Going through the usual 'Gang of Five' suspects one by one there was an extraordinary catalogue of problems. But even without them we can doubt they'd have got with the flying green Benettons. And as noted the Benettons were not without problems of their own. It got worse for the rest too, as not only were the green pair quicker than the rest the assumption was that with their hard, durable Pirellis (how times change, you might reflect) they'd be able to go through the race without a tyre change, while their mostly Goodyear-shod pursuers would almost certainly require a stop. "Nothing to do against them" mused Prost later, "I could only hope they would take care of themselves..."
It looked slightly better for Prost off the start as a good launch got him up to third, albeit behind those same two Benettons. Berger got the better start of the two and led. For the first time anyone could remember there was no accident in the track's narrow run to turn one. After the first three the order was Mansell, Piquet, Rosberg and Senna. 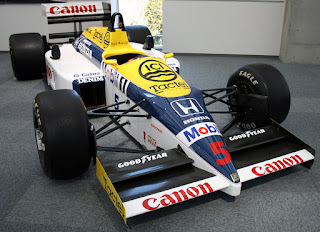 "Williams FW11 Honda Collection Hall"
As for the Brabhams? They'd had yet more problems and this time of the final sort. Patrese, now in the spare car after his qualifying's incendiary conclusion, had his gearbox break on the way to the grid. Warwick therefore was required to give up his car for Patrese and sit this one out. Yet it didn't matter, Not only was Patrese slow away, circulating the first lap in midfield, a gearbox break for Warwick in the warm up session had over-revved the BMW engine, and despite attempts at repairs between times the problem hadn't gone away for the race. The engine now in Riccardo's use blew up on lap two and he toured gingerly in to retire. A highly promising weekend's hopes were done after two race laps. In stark contrast to Benetton's introduction, for Brabham it was a sad stop-off on what proved to be a terminal decline for the once great team. But just as in qualifying the Benettons looked perfectly capable of stepping in in their stead. Immediately they opened a gap on the rest and after 12 laps the advantage to third was ten seconds. Clive James noted that it was just like the usual pattern of 1986 with the 'Gang of Five' out front, with the glaring difference that the two Benetton cars were circulating far ahead. "As if Rosencrantz and Guildenstern had both appeared on stage dressed as Hamlet, and refused to go off again" he observed inimitably. Despite local Austrian sensibilities Fabi looked at times like he fancied the lead for himself, and periodically got with Berger and danced around his gearbox. Privately however he knew already that it was likely a futile exercise as his car had jumped out of gear - either a result of hitting a kerb or 'bottoming' against the road surface - which resulted in the engine over-revving. Fabi realised that an engine failure only was a matter of time. It was, and it struck at the cruellest moment. By lap 17 Fabi had got with Berger again, and managed indeed to slipstream past him on the downhill run to the fearsome Boschkurve. 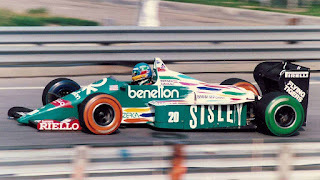 But Fabi could not even reach the exit of the same Boshkurve before his Benetton slowed and Berger nabbed the lead back, leaving the Italian little choice but to cruise to the pits to call it a day. This left Berger in the sole-remaining Benetton on his own. Murray Walker was known for his kiss of death, usually in his commentary declaring some driver untouchable moments before the said driver binned it or their car fell to pieces. He did something like it this time as all including leader Berger approached half-distance. Although it was with a twist, that what he said proved somewhat prescient. "So far this season...the Benetton team have actually had 14 retirements in the 11 races we've had so far" he cautioned. And not long after he uttered as much Berger pulled into the pits on lap 25. Perhaps he needed a tyre change after all surmised a few. But no, the crew changed the wheels but as part of their standard drill only, as evidenced by them lifting up the car's engine cover shortly after. Berger in fact had reported a misfire and peeled in accordingly. It transpired that it was as simple as a flat battery. It took somewhere in the region of four laps to resolve. Undeterred though, or perhaps wishing to get the associated frustration out of his system, Berger tore back into the action after this and went fast for the rest of the way, claiming a fastest lap some 1.3 seconds under what anyone else managed and finishing just one place out of the points. A point had been made though, not that it was needed, that there was no doubt who would have won given a trouble-free run that day. He didn't have long to wait for his and his team's freshman win either, three races to be precise, when he won in the Mexico race mentioned after vaulting his rivals with the sort of non-stop run expected here. 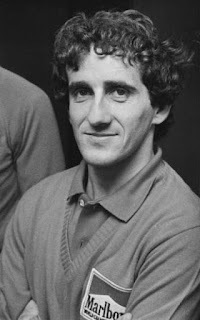 The altogether more familiar-looking Prost-Mansell couplet who had been running as a pair since the start therefore inherited the lead. Mansell pitted for his routine wheel change several laps after Prost and when he rejoined the Frenchman was some 11 seconds up the road, a combined consequence of Alain putting the hammer down - on fresh rubber he was happy with his handling for the first time that weekend - plus Nigel being delayed by Stefan Johansson ahead about to be lapped having his front wing fly off. Yet Prost looked the quicker even after Nigel got back into the running, but the Englishman was happy enough as Piquet had just dropped out with engine overheating problems and from the championship angle all looked good (Senna also had been forced to quit earlier). But about as quickly as everyone could conclude thus Mansell had disappeared himself. His driveshaft broke, for the second time that weekend, which again left him stranded out on the circuit. It was a day of extraordinary attrition even by the standards of the day - one could scarcely draw breath between retirements. 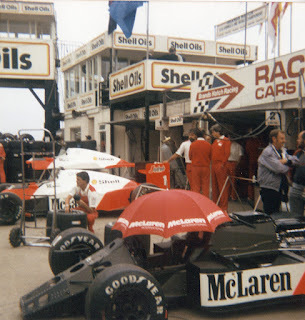 It appeared though that things finally would calm down at this point, as Mansell's retirement gave all a balmy 1984-style McLaren one-two, with Prost half a minute ahead of Rosberg; the next guy - Michele Alboreto's Ferrari, as it happened - a lap down. Prost was set to win with his rivals for the title getting nil points and if you needed anyone to bring a car home to save your life it would be Alain. All indeed were merely reeling the laps off it seemed. But the day had an additional sting of sorts. As even the resolute McLarens hit technical trouble. With five laps left Prost's coughed going through the chicane - his engine apparently dead before letting the clutch out and resuming. And Rosberg's developed a similar problem, that of the TAG cutting out intermittently in the late laps of a race, this time it manifested itself mainly under braking. It looked like the Ferraris - here as in most places in 1986 barely a factor - might even get an unlikely one-two... The Italians watching on noticed and got suitably encouraged. "Eventually it was going to die for good", said Prost. "I knew that. It was happening every time I braked...In the last three or four laps it was starting to misfire - sometimes it even cut out on the straight...I really thought I would not get to the finish". Rosberg indeed had to park before the end. But Prost, somehow, kept going to win. And for him it was just as well. That day Prost got nine points over his title rivals - and from clinging to their coattails by a fingernail at the start of the weekend he now was in second place in the table but two shy of Mansell with four rounds remaining. Nothing to tell in other words. And while the age of dropping worst scores muddies things a little in the end he won the championship by two. This as much as the exploding Goodyear that we all remember ensured Alain his scarcely-credible 1986 title. That which we all remember.